Senior steward Francesco preps Grand Suite ‘Istanbul’ in preparation for its very first guests. IRT Photo by Rachel M. Hardy. It’s been just over two months since I flew to Italy to inspect the three brand-new Grand Suites aboard the Venice Simplon-Orient-Express. I was lucky enough to be one of six travel professionals invited aboard for the Suites’ inaugural journey and unveiling party — and the only advisor from the Western Hemisphere to be included. Grand Suite ‘Venice.’ IRT Photo by Rachel M. Hardy. I shared many beautiful images in my first blog post (click here to read), but I wanted to return to the subject to expound further on all of the intangible elements that make the Grand Suites so exciting. Grand Suite ‘Paris.’ IRT Photo by Rachel M. Hardy. What can Grand Suite guests expect on their trip in addition to opulent surroundings? For one thing, total privacy — if you want it. The Grand Suite carriage will always be placed at the rear of the train, in order to ensure no ‘regular’ guests stumble through by accident. And meals can be served in your cabin, where your living area easily converts into a romantic space for dining. Grand Suite ‘Istanbul.’ IRT Photo by Rachel M. Hardy. For another, regal, attentive service. Grand Suite guests will share one dedicated senior steward for the duration of their trip. (For comparison, one steward is assigned to each twin carriage, tasked with managing up to 18 guests at a time). Copper rain shower with exclusive Guerlain bath products. IRT Photo by Rachel M. Hardy. Finally, at the press of a call button, your steward will graciously appear with chilled champagne — included throughout your journey with the booking of a Grand Suite. Towels emblazoned with the train’s emblem. IRT Photo by Rachel M. Hardy. And if you’re lucky enough to be one of the very few in a Grand Suite on the Paris-Istanbul or Istanbul-Paris journey, your Grand Suite will land you in upgraded hotel rooms — Suites, to be precise — in Bucharest and Budapest. So what does the VSOE offer to those of us who aren’t able to spring for a pricey Grand Suite? (prices run far into double digits — in pound sterling — on the longer journeys). Luckily, the train staff expertly create an atmosphere on board the train where every guest is treated like visiting royalty. Full-length wardrobe (seen at left) — one of two in every Grand Suite. IRT Photo by Rachel M. Hardy. This offer also applies to a select few departures from London/Paris to Venice on the following dates: July 19, October 28, & November 8. You must reference this blog post, and you must book your journey before June 30, 2018. If you are ready to book, or if you have questions, please call us at (800) 478-4881 or (502) 897-1725 if outside the US / Canada — or e-mail us at tourdesk@irtsociety.com. Click here for more info about the Venice Simplon-Orient-Express, and a list of itineraries offered. We look forward to welcoming you aboard! Rachel M. Hardy is Vice President, Sales & Marketing, and Virtuoso luxury travel advisor for The Society of International Railway Travelers®. She specializes in luxury rail and adventure in Europe, South America, Africa (rail & safaris) and Canada. She was the first advisor from the Americas invited to see the new Grand Suites on the Venice Simplon-Orient-Express. Our agency is a proud member of Virtuoso and the exclusive Belmond Bellini Club. New York, NY — The Belmond Grand Hibernian, Ireland’s first luxury train, made its formal debut in America April 28 at New York’s Grand Central Terminal. The train is under construction; service is planned to begin August, 2016. Authentic Irish music, draughts of Guinness and Irish Bell floral corsages underscored Belmond’s hopes for its newest “dream train:” a genuine, sensual, over-the-top experience of the Emerald Isle’s true spirit, both north and south. The IRT Society joined a group of about 150 Belmond officials and representatives from the travel trade and press at a gala celebration in the station’s ornate Campbell Apartments. As with the Belmond’s other luxury trains, such as the Royal Scotsman and the Venice Simplon-Orient-Express, the Grand Hibernian will offer “land cruises,” with no need for guests to pack or unpack. The tours will include all locally sourced, exquisite meals as well as “shore excursions” to castles, manor houses, distilleries as well as visits to exclusive venues normally not open to the public. It will also include all drinks throughout the program – including exclusive distillery tastings. The six-night itinerary, the train’s longest, looks like a winner, if advance interest by guests of The Society of International Railway Travelers is any measure. IRT chartered the Grand Hibernian’s Aug. 30-Sept. 6, 2016 “Grand Tour of Ireland” just last week, and already only three of the train’s 20 cabins remain unsold. 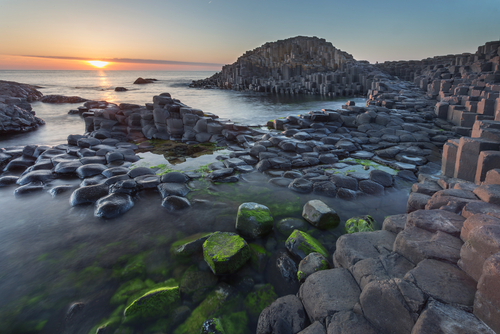 The six-night tour combines two shorter tours: a four-night tour of the Republic of (south) Ireland and a two-night tour of Northern Ireland. Franklin, a native New Zealander, fell in love with Ireland decades ago as a young man, he told his guests. In 1991, when he journeyed to Ireland to watch the rugby world cup, his team lost, but Ireland won his heart. The germ of an idea was born: the Grand Hibernian. The Grand Hibernian’s dress code will be “casual luxury” — neckties for men will be optional. Based on IRT’s over 30 years experience in the luxury train market, this news will be greeted with cheers by many (and perhaps shrugs by a few, this writer included).